Africa is literally moving upwards, with buildings being erected every passing day. Interesting to note, some of these skyscrapers (multi-story buildings whose architectural height is at least 100m) are part of individual countries’ rigorous infrastructural development plans, meant to boost the continent’s economic expansion in one way or another. Others have even acted as tourist attractions for years. While this list compiled by Jumia Travel focuses on the reigning top 10 Skyscrapers in Africa, the ‘reigning’ giants may soon be overtaken by upcoming projects such as the proposed 540m high Al Noor Tower in Casablanca, Morocco. 447m South Africa’s Symbio City is also in the pipeline, while Hass Tower 1 (Nairobi Tower) in Kenya and Ghana’s Hope City will stand at 300m and 270m respectively. With the completion of these and more proposed skyscrapers in Africa, we definitely will be writing a different script in just a few years. Carlton has been unrivaled for the last 4 decades since 1973, standing at 223m high with 50 floors. Located in Johannesburg, South Africa, the Center houses offices and shops and is linked to the Carlton Hotel. This is a definitely see any time you visit Joburg. Talk of skyscrapers and this religious building makes it second with its minaret standing tall at 210m – the largest in the world. Grande Mosquée Hassan II popularly known as the Hassan II Mosque is the largest in Morocco and the 7th in the world and is located in Casablanca . The Mosque’s Goldaste is 60 floors high and can house approximately 105,000 worshipers at a time, both inside and on its outside grounds. Another one of South Africa’s Johannesburg, City Ponte is the tallest residential building in Africa with a height of 173m. The cylindrical skyscraper is 55-story high, whose core (the open center) allows extra light into the apartments. Residents have the advantage of an extremely beautiful and unbeaten view of Joburg, making it a favorite of many. The highest building in Kenya’s capital city of Nairobi that opened its doors earlier this year, houses offices in its 33-stories in the Upper Hill area. At 163m high, the skyscraper took the first position upon completion in 2015, transcending the 15 years’ record held by Times Tower. Formerly known as NITEL Tower, NECOM House in Lagos is the tallest skyscraper in Nigeria and in the whole of West Africa at 160m. The building houses the Nigerian Telecommunication Company (NITEL) with its communication spire at the top serving as a lighthouse beacon for Lagos Harbor. 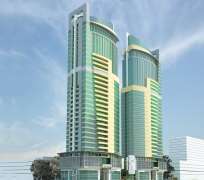 Tanzania’s PSPF Towers (A & B) located Dar es Salaam , have a postmodern architectural style with 35 stories. Completed in 2014, the towers are fondly referred to by residents of the East African country as the ‘Pride of Tanzania’. 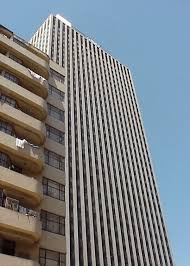 Seventh on the list and third from Joburg, Marble Tower, previously Sanlam Center, largely consists of commercial offices and stands tall at 152m. It has 32 floors, out of which 8 are a parking garage. Also at 152m and 31 floors, Pearl Dawn as it is commonly known is perhaps the most eye catching skyscraper in this list; due to its modern architecture and opulent style. The lavish residential building is located along South Africa’s North Coast of KwaZulu Natal, along the iconic Indian Ocean Coastline, offering its residents a cool breeze to complement their luxurious stay at the fully furnished apartments. This is the main bank of South Africa and the 38-story building is 150m high, the tallest in Pretoria with a black glass and Rustenburg granite frontage. Located on the foreshore of Cape Town in South Africa adjacent to the Cape Town International Convention Center in the City Bowl area, this skyscraper that takes position 10 on our list is also 150m high and has 28 floors. Metlife offers unsurpassed view of Robben Island with a 22m tall spire on the roof.